Meet Cute is an anthology featuring many different (notable) authors. The audiobook has a full cast of narrators reading short stories about the first time people met. 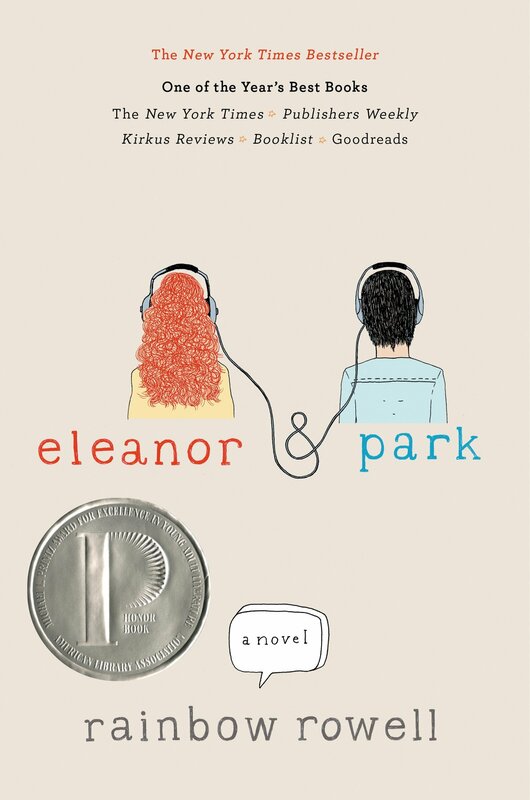 It is young adult, and several of the stories feature LGBTQ main characters. At least one story is a fantasy, and most are realistic fiction. What I liked about this book was the different stories of first meeting. I can’t think of which story was my favorite (because all stories are my favorite! ), but I really enjoyed the experience of listening to the variety of stories. I also liked that although they were love stories, they weren’t all lovey dovey and happy. I can’t remember the last anthology I read, much less listened to, so this was a good experience. What I didn’t like about this book was that some of the stories weren’t as good and engaging as others. Some I didn’t want to end, but some were too long. I didn’t know where certain stories were going, and can’t remember the endings. Not too long ago, I read Flat-Out Love at the request of a friend, and while I started out cynical, I’m a sucker for a good love story. Or a bad one. Or one that is only so-so. What ever the quality, this is a love story, and I got sucked in right away, and wanted more from the characters. Flat-Out Celeste is the third installation, and a secondary character is now is the main character. Celeste struggles socially. We as the readers might immediately think aspergers, but she is never actually diagnosed. Celeste is beyond smart academically, but does not have any friends because of her awkwardness. She has her choice of colleges, including Ivy League, but she starts getting emails from Jason, a student liason at Barton College, and they correspond regularly until it becomes flirtatious. They finally meet, and go out on a very awkward date. Celeste’s social anxiety starts to improve, and she and Jason make an instant connection. Despite some tough situations, Celeste’s life seems to be on track with Justin. She decides to try and fix her brother’s relationship with his exgirlfriend Julie (whose romance began in Flat-Out Love). All in all, this is a book filled with hope (for the socially awkward) and love (for all). It isn’t cheesy, but you may throw up a little in your mouth during some of Celeste and Justin’s conversations. What I liked about this book was that it gives me hope for my weirdos. I have had several students with autistic-like behaviors, students who wouldn’t understand a social situation no matter what drawing or map you made for them, etc. If Celeste and Justin can kindle a relationship and keep it going despite a distance, then there’s is hope! What I didn’t like about this book was that there were so many errors! It was like the book had never seen an editor and was just published to the Internet. It bugged me, but it didn’t take away from the story itself. Flat-Out Love is super cute! It’s that love story genre that isn’t always my first choice, but I usually enjoy the books when I read them. Julie Seagle is a college freshman in Boston, a city she’s completely unfamiliar with. She finds herself homeless, duped by a fake Craigslist ad, but her mom’s college roommate comes to her rescue and lets her stay in their home with Celeste and Matt, her two children. Matt is a geeky college student, and Celeste is a “different” eighth grade girl. There is also a mysterious brother named Finn who isn’t around, but Julie has a Facebook romance with him. Their mother Erin and father Roger are absentee parents, being busy with their careers, so Matt is left to take care of Celeste, including carting around Flat Finn, a cardboard cutout of Finn. Julie steps in to be Celeste’s friend, take some of the load off of Matt, and help Celeste fit in and be a little less strange. Of course, there is love and everything hits the fan. This is also a bit of a mystery (slightly predictable), but it was a fun read, and engaging until the end. What I liked about this book was the romance, of course. Without the romance, I’m not sure the storyline would have been nearly as engaging. A mysterious brother? Drunken phone calls? A nerdy but handsome brother who goes out of his way to be a knight in shining armor? It has everything. What I didn’t like about this book was the shocker with Finn. That was upsetting. Predictable, but upsetting none the less. I am not sure how I felt about his story. That’s all I can say without giving away too much. Book 19 of summer 2017! Crush is another book from the series about Kevin Spencer. There was no specified order of the books, but I’m assuming this is the third book, and I should have read Flat Broke after Liar, Liar instead of skipping to Crush, but I didn’t have trouble understanding what happened. There was some sort of money-making, get rich quick scheme that happened and Katie was taken advantage of. At least, that was all I gleaned from this book. Anyway, Kevin has a huge crush on a girl named Tina. Let me tell you I freaked out (hyperbole) when I read her name. In Liar, Liar, her name was Katrina Marina. In this book, she’s Katrina Maria. I don’t know why that bugged me so much, but it did. Anyway, Tina is in charge of showing a new boy around, and he’s a good-looking, cocky kid who makes Kevin feel threatened. Kevin interviews several people about love, romance, and dating, and he tries setting up several of his friends to observe what happens on their dates. Kevin is desperate to learn more about what it’s like to be in a relationship, although he feels he is already the perfect mate. All’s well that ends well, and the story has a happy ending. What I liked about this book was that it was humorous. It is another quick read, but the level of vocabulary and expressions is higher than I expected. I can’t say I’ve enjoyed any of Gary Paulsen’s books (the few I’ve read would be categorized as “drama” and those generally don’t appeal to me), but these were pretty funny. He’s a smart aleck, and I appreciated the quick-witted dialogue and Kevin’s creativity in his schemes. 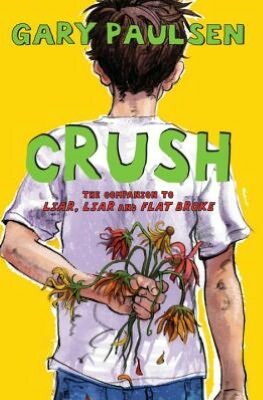 If Paulsen’s other books are like Crush, I may have to give them a chance. What I didn’t like about this book isn’t obvious to me right now. I may need to know more about what happens after this story ends, because I feel like there’s been a lot of build up. After 3 books of Kevin trying to date Tina, I want to know if he learned anything!